Manika Nagare, featured in a solo show at Pola Museum of Art earlier this year, reinterprets the colors of classic oil paintings. The Colors Have Gone Through at Yuka Tsuruno Gallery includes new works, notably abstract pieces condensing the hues found in Sanzo Wada’s “South Wind,” a 1907 study in Western depictions of light. Ends December 22. Deities Dwell on Vessels: Decorations and Motifs of Chinese Bronzes at the Sen-Oku Hakuko Kan Museum in Roppongi displays Bronze Age treasures shaped like and decorated with ancient Chinese gods. These bronze pieces have had a long-lasting, far-reaching impact on the styles and symbols of East Asian Art. Until December 24. MuPon users receive admission discounts. Tokyographie is the capital’s version of the annual Kyoto photography festival Kyotographie. The main program currently features six shows at locations around Tokyo, including Tadashi Ono’s “Costal Motifs” documenting sea walls going up in Tohoku. “Invisible man” photographer Liu Bolin presents images of champagne estate workers camouflaged in vineyards. Izumi Miyazaki’s “Up to Me” showcases her cleverly inventive self-portraits. All exhibits are free and the program ends Dec. 25. Individual exhibition dates vary. Simple Things at Wako Works of Art brings the pioneering performance artist Joan Jonas back to Tokyo, where she got her start in videography almost 50 years ago. Two videos, including one “directed” by her poodle Ozu, plus footage of a 2014 live performance in Milan, highlight her groundbreaking experiments in the art of the image. Through December 26. 50 Years of Big Comic at Kawasaki City Museum looks back on the manga magazine’s five-decade run with some 300 original illustrations by artists who have graced its pages, such as Osamu Tezuka and Shigeru Mizuki. Ends January 14. McDonald’s Radio University turns Misa Shin Gallery into a burger joint of higher learning. Dramatist Akira Takayama recreates his project in Germany that serves up radio lectures by immigrants and refugees at actual McDonald’s restaurants. The Tokyo edition broadcasts a selection of the German lectures and the stories of Japanese children orphaned in China when their families repatriated at the end of WWII. Through January 19. Resistance of Fog is a retrospective for Fujiko Nakaya, awarded this year’s Praemium Imperiale in sculpture for her works that replicate particles of natural fog in indoor and outdoor environments. Art Tower Mito in Ibaraki Prefecture samples from her internationally celebrated practice with recreations as well as new displays while delving into her philosophy as an artist. The museum’s fountain is used in one of her misty installations. Ends January 20. Toeko Tatsuno is known for her contributions to abstract painting, becoming in 1995 the first woman and the youngest artist to have a solo show at the National Museum of Modern Art, Tokyo. Toeko Tatsuno: On Papers – A Retrospective 1969–2012 is her most extensive exhibition to date, surveying work from her student days through her late years with a focus on her prints and other paper-based works. 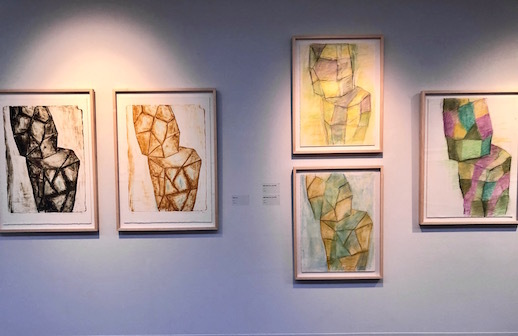 It is fascinating to see how her expressions transformed from tightly controlled grid patterns to free abstraction while certain motifs remained constant throughout her career. Until January 20. The Mitsubishi Ichigokan Museum introduces The Phillips Collection: A Modern Vision featuring holdings that became the first modern art museum in the United States. Around 75 works (mainly paintings) date from the 19th through mid-20th centuries and include major figures like Monet, Degas, van Gogh, Picasso, Klee, and Giacometti. Special attention is given to the modernists influenced by Japanese Ukiyo-e artists. Through February 11. MuPon discounts. Mingei – Another Kind of Art is the brainchild of designer Naoto Fukasawa, director of both 21_21 Design Sight, where this exhibit is held, and Tokyo’s Japan Folk Crafts Museum. His selections of 150 traditional and contemporary mingei folk crafts reflect on the origins of this homespun Japanese art form while considering its legacies in today’s design. Ends February 24.